A celebration of the ubiquitous metal that is gold. Amouage Gold Man Eau de Parfum Spray is a decadent fragrance that exudes sophistication and masculine presence. Everything about Gold suggests splendour and magnificence, from its golden flacon to its evocative fragrance. Daring florals are blended with the headiness of spices and musks, making for an unforgettable and indulgent scent reminiscent of classic chypres of the 1930s. A hedonistic aroma to be cherished and worn in times of utmost luxury. 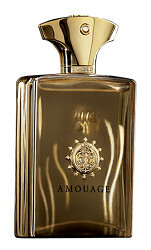 Amouage Gold Man Eau de Parfum Spray is rated 4.0 out of 5 by 2.